Everyone has a different idea as to what makes a Best Sun Peaks condo rental in the best ski-in and ski-out location at Sun Peaks Resort. 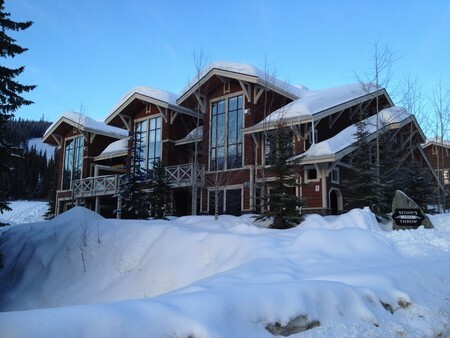 But in our humble opinion - we think our BestSunPeaks condo is it! And judging from a few of our Stones Throw Sun Peaks reviews, so do our guests. Or if you need something bigger, check out our new to the rental market in September 2016, 4+ bedroom luxurious townhouse in Trapper's Landing - great for large single families or even two families. Once we fell in love with Sun Peaks Resort and all the great activities that we can enjoy year-round to keep us healthy , we needed to find the best possible Sun Peaks condo that would suit our family needs, as well as those of as many guests as possible. We spent several months going through numerous potential Sun Peaks Vacation Rentals, and kept coming back to one particular unit – it was spectacular! If our Best Sun Peaks condo or Best Sun Peaks townhouse is unavailable during your preferred dates, you can save on other Sun Peaks condos, townhouses and chalet with this Best Sun Peaks Discount Link. Plus we promote other Best Sun Peaks vacation Rentals - just contact us and we will try to help find some great Sun Peaks accommodation for you. It was situated in the Stone’s Throw development, which is one of the newest and most desirable condo developments at Sun Peaks. And since it was on multi-levels and had a spacious layout, it seemed as nice as any townhouse we viewed. We researched to see if it was a good time to buy a property at Sun Peaks Resort - and yes it was. A great time for Sun Peaks real estate in fact!! This wonderful, upper level Sun Peaks condo was fully upgraded, and with some extra touches we ensured it would meet and hopefully exceed the expectations of all our guests. So we bought it and then tried to anticipate what our guests would want in a Best Sun Peaks rental condo, and did our best to please as many as possible. And we loved it so much, we bought a second Sun Peaks Vacation Rental in 2016 - see our Trapper's Landing Vacation Rental Townhouse. And we absolutely love both of our Sun Peaks Vacation Rental properties!! Here are a few excerpts from our recent guests. Full reviews can be found on our Stones Throw Sun Peaks Reviews page. “Communication with owners was superb; they are reachable within an instant and ready to help in any way! 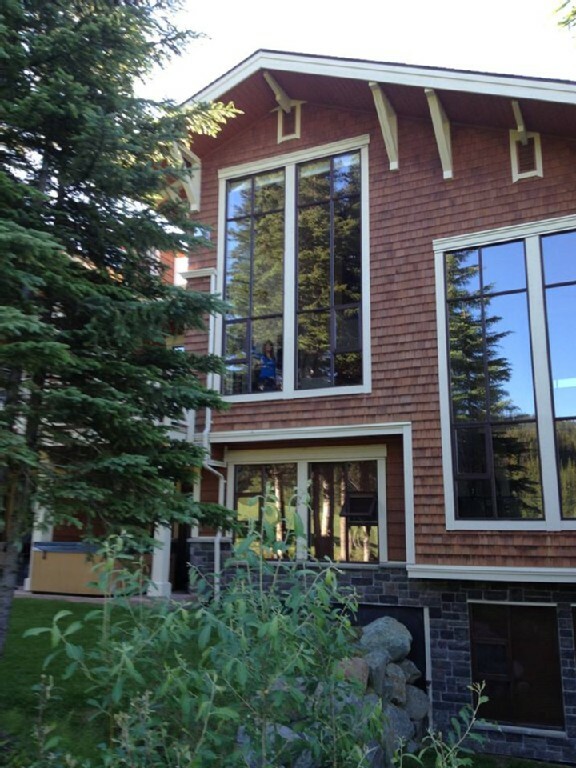 We are already planning our next trip back to Sun Peaks Resort"
“The entire place was immaculate and well equipped. The view was great from the deck while enjoying the hot tub, which was rarely empty." 10 – Space. While we respect the great Sun Peaks hotels and other Sun Peaks vacation rental condos available at Sun Peaks, we offer you more space. Over 1,200 square feet of luxurious, fun, entertaining space. We have floor space, private space and even air space (check out the incredible vaulted ceiling and exterior spacious views). 9 – Parking space(s). Even better than point number 10, we offer two free, secure, underground parking spaces. And since we’re just minutes from the village center and ski-in/ski-out, just park your car(s) and enjoy your space(s) even more as you enjoy a wonderful, best Sun Peaks Vacation. 8 – Fun. In addition to convenient and easy access to all the many year-round fun activities offered at Sun Peaks, we have two PS3 gaming systems and BluRay DVD players, Netflix, fun family board games, and you can even run out and collect golf balls that go astray from golfers having fun at the 16th hole of the Sun Peaks Resort Golf Course which we back on to. We are fun! 7 – Options. Spacious options and fun options. 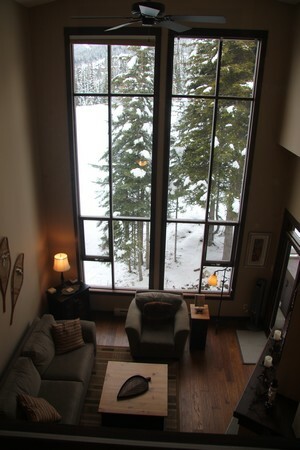 With two private bedrooms on the main floor, and a private, enclosed loft/bedroom/games room on the top floor, we offer a fantastic space for anywhere between 2 and 8 people to have a wonderful stay at this best Sun Peaks condo. And if you like your own private space, the whole Stone's Throw condo can be yours and yours alone for the duration of your stay! How is that for options!? 6 – Social media friendly. Yes, that’s right. How many other condos at Sun Peaks are worthy of their own page on Facebook, @bestsunpeaks on Twitter, or have their own website full of information about the many wonderful ways to enjoy a Best Sun Peaks Condo Vacation!? Oh, and there is free Wifi and Netflix! 5 - Healthy. You may ask how a Sun Peaks condo can be healthy? Easy! In addition to having two levels with stairs to help you get warmed up for your Sun Peaks activities, our kitchen is also fully stocked with great cooking utensils including a George Foreman style grill so you can cook your own healthy meals when you tire of eating out at the many popular restaurants in the village. 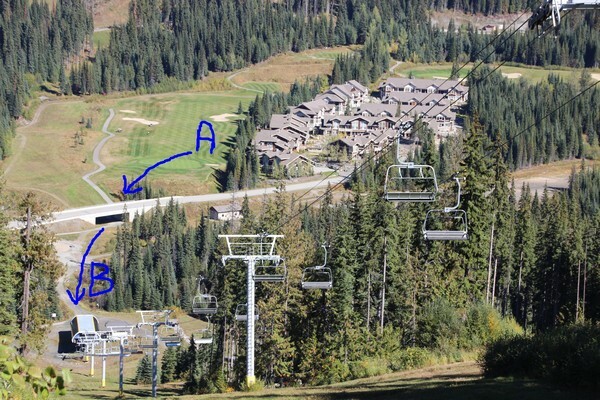 It is also just a few steps away from the Sun Peaks Valley Trail Network which offers a lovely walk to/from the village. 4 - Privacy. 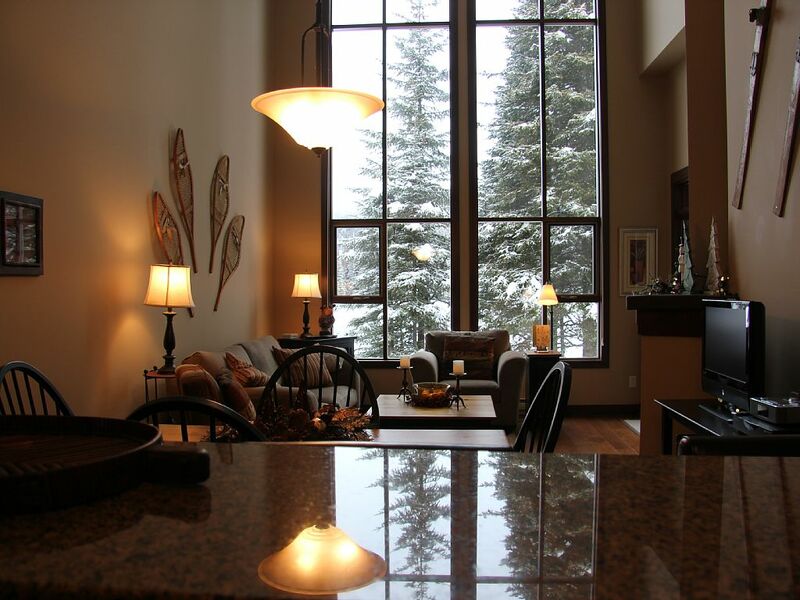 With a mountain full of enthusiastic, fun loving people of all abilities and ages, you are renting a beautiful, spacious, fun, private condo, complete with spectacular private views and a private hot tub. Oops. Forgot your hot tub gear – no problem at this Best Sun Peaks condo!? 3 – Location, location, location. Yes we are located around the corner from the village. But since you parked your car in one of our two secure, underground parking spaces, you can relax knowing that Stone’s Throw is considered by some very experienced locals to be the best ski-in/ski-out location at Sun Peaks. Avoid the village line-ups and ski a few hundred feet from the front door of your best Sun Peaks condo to Mt. Morrisey and the Morrisey Express Lift and quickly be on the slopes while others are waiting in the village. And if you want to come back for lunch or for your hot tub at the end of the day, just head down Fair Dinkum and ski right down to your wonderful condo. Are your kids tired of skiing? Walk the little ones across the road to the toboggan hill in the winter, or let them collect golf balls from the back yard in summer since we back onto the 16th fairway of the Sun Peaks Golf Course. 2 – Everything. We have tried to think of everything. In addition to having a spectacular Sun Peaks condo with spectacular views, we have tried to ensure this unit is your perfect home-away-from-home mountainside ski-in/ski-out condo. From flexible sleeping options, two PS3 gaming and video systems, videos, board and card games, hot tub, washer and dryer, luxury upgrades, and a fully equipped kitchen, we want you to ensure you and your friends and family enjoy a Best Sun Peaks Condo Vacation ever. 1 – Spectacular. When we first visited Sun Peaks Resort, we thought it was a spectacular, family-friendly, year-round, recreation center and ski resort. And when we decided we wanted to invest and visited many wonderful properties at Sun Peaks, this one was spectacular! The spectacular 20 foot high windows with private views, spectacular vaulted and spacious ceilings, flexible accommodations for our blended families, and wonderful and thoughtful upgrades, this best Sun Peaks condo offered it all. We offer all this at a very reasonable price and as a result you get way more recreational enjoyment for your dollar. And as you can see from the picture, skiing out via the Morrisey Express is as easy as getting from A to B! Once you enjoy a stay here, booking at a standard hotel room or other Sun Peaks condo will not be an option. We even have a Sun Peaks Vacation Planning Guide page to help you prepare for your holiday. Time to invest in your own Sun Peaks Real Estate or recreational property - yes it is!! You can book your Sun Peaks vacation rental without extra booking fees directly through our BestSunPeaks condo page or simply complete and submit the form below and ask about getting our best rates without any booking fees!. We will reply as soon as possible with pricing and availability. View our Trapper's Landing townhouse - same great everything - just bigger!